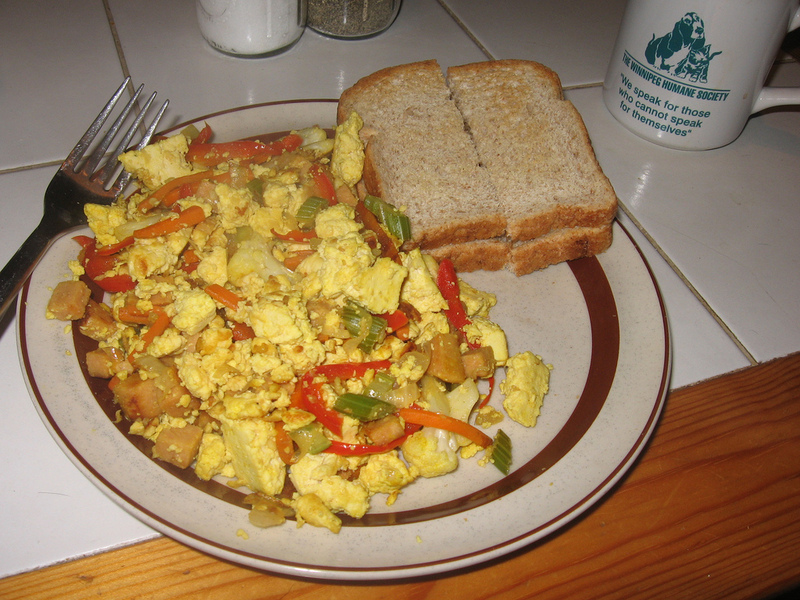 I have eaten many tofu scrambles in my life. From Sadie’s Diner in Toronto, Joseph’s in Woodstock, New York, Veg Out in London, Café My House here in Ottawa, The Cornerstone in Guelph…. Ingredient-wise, they are all pretty much the same. A bit of oil for frying, various kinds of veggies, tofu, tumeric to make it yellow. And yet, they range in palatability from divine to vomitous. Successful tofu scrambling, you see, is all in the technique. I am going to share it with you all today so that you can a) create your own marvellous vegan scrambles at home and b) share the info with those foolish restaurants that continue to charge for the masses of tasteless slop they have the nerve to call tofu scramble. Now, this is the veggie mix I like….you can really use whatever you want. Though if you don’t use the tomatoes, you might want to throw in a tsp of vinegar for the acidity. Now the important part: technique. 1. Cook onions in oil on medium heat until soft and carmelized, about 15 minutes. 3. Add crumbled tofu (not diced – diced won’t absorb the flavours), crumbled bouillon cube, faux sausage and tumeric. Cook on medium high using the “smash and scrape” technique. You scrape the browning stuff of the bottom of the pan, and smoosh it into the scramble…Repeat this for 3-5 minutes until the scramble is pretty dry. This is really the key part – incorporating the yummy scortchy stuff from the bottom of the pan and evaporating the flavour-killing liquid from the veggies and tofu. 4. Add salt and pepper to taste. 5. Might as well throw on some Daiya too, while you’re at it. A side note – if you leave out the faux sausage and replace the tomatoes with salsa, you can make pretty darn good faux huevos rancheros…just serve wrap the scramble in a tortilla and serve with avocadoes, salsa and vegan sour cream. So there you are…happy scrambling to all! I generally use soy sauce instead of salt, and some nutritional yeast. I put the damn stuff in everything but my baking. Oh and garlic…lots of garlic!